Udham Singh, a revolutionary nationalist, was born Sher Singh on 26 December 1899, at Sunam, in the then princely state of Patiala. His father, Tahal Singh, was at that time working as a watchman on a railway crossing in the neighbouring village of Upall. Sher Singh lost his parents before he was seven years and was admitted along with his brother Mukta Singh to the Central Khalsa Orphanage at Amritsar on 24 October 1907. As both brothers were administered the Sikh initiatory rites at the Orphanage, they received new names, Sher Singh becoming Udham Singh and Mukta Singh Sadhu Singh. In 1917, Udham Singh's brother also died, leaving him alone in the world. 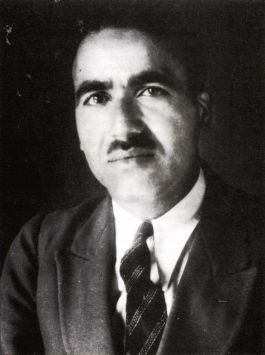 Udham Singh left the Orphanage after passing the matriculation examination in 1918. He was present in the Jallianvala Bag on the fateful Baisakhi day, 13 April 1919, when a peaceful assembly of people was fired upon by General Reginald Edward Harry Dyer, killing over one thousand people. The event which Udham Singh used to recall with anger and sorrow, turned him to the path of revolution. Soon after, he left India and went to the United States of America. He felt thrilled to learn about the militant activities of the Babar Akalis in the early 1920's, and returned home. He had secretly brought with him some revolvers and was arrested by the police in Amritsar, and sentenced to four years imprisonment under the Arms Act. On release in 1931, he returned to his native Sunam, but harassed by the local police, he once again returned to Amritsar and opened a shop as a signboard painter, assuming the name of Ram Muhammad Singh Azad. This name, which he was to use later in England, was adopted to emphasize the unity of all the religious communities in India in their struggle for political freedom. Udham Singh was deeply influenced by the activities of Bhagat Singh and his revolutionary group. In 1935, when he was on a visit to Kashmlr, he was found carrying Bhagat Singh's portrait. He invariably referred to him as his guru. He loved to sing political songs, and was very fond of Ram Prasad Bismal, who was the leading poet of the revolutionaries. After staying for some months in Kashmlr, Udham Singh left India. He wandered about the continent for some time, and reached England by the mid-thirties. He was on the lookout for an opportunity to avenge the Jalliavala Bagh tragedy. The long-waited moment at last came on 13 March 1940. On that day, at 4.30 p.m. in the Caxton Hall, London, where a meeting of the East India Association was being held in conjunction with the Royal Central Asian Society, Udham Singh fired five to six shots from his pistol at Sir Michael O'Dwyer, who was governor of the Punjab when the Amritsar massacre had taken place. O'Dwyer was hit twice and fell to the ground dead and Lord Zetland, the Secretary of State for India, who was presiding over the meeting was injured. Udham Singh was overpowered with a smoking revolver. He in fact made no attempt to escape and continued saying that he had done his duty by his country. Copyright � Harbans Singh "The encyclopedia of Sikhism. " The word "militant" on this document was replaced on the request of Mr. Bhupinder Singh (bhupinder787@yahoo.com).